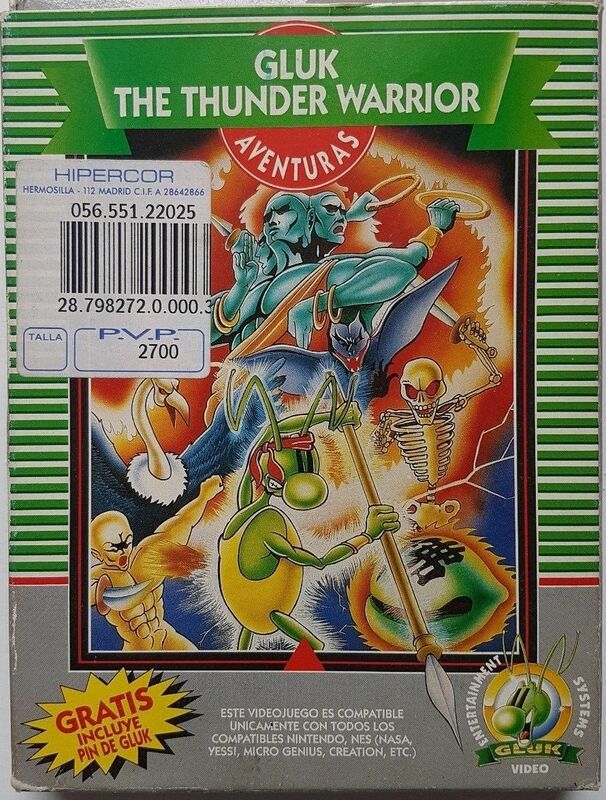 The boxes only included the cartridge with the exception of "Gluk the Thunder Warrior" that has a badge ( ) and one version that comes with a printed instruction manual , for the rest of the games the instructions come in the back of the box. The games were announced as compatible with consoles "NASA, YESS!, MICRO GENIUS, CREATION, SILVER SHADOW, ETC. ", on the second wave they mentioned NES compatibility, although this has to be verified. 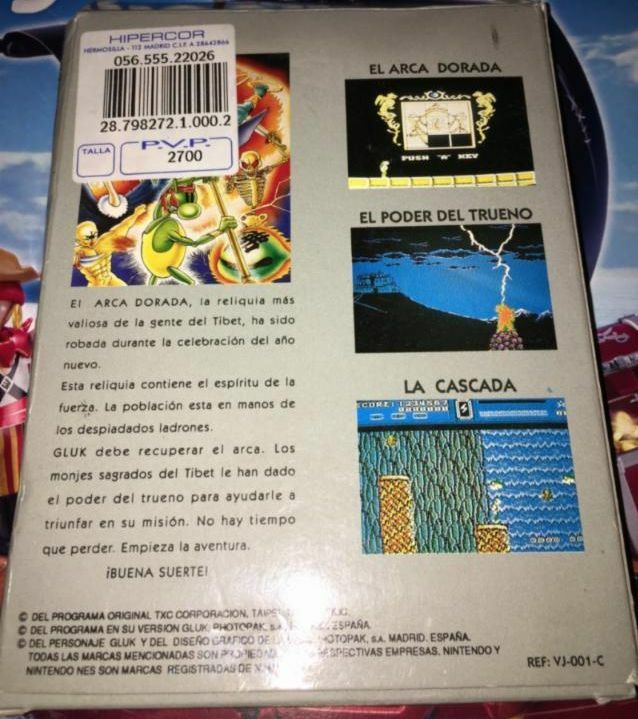 The first 5 games "white box" contain the legal deposit on the rear of the box, so there must be copies of them in the "Biblioteca Nacional de España" starting with the sixth there is no such number. THe price of the games varied from 2.700 Ptas (16,22 €) to 500 Ptas (3 €) on the last ones. 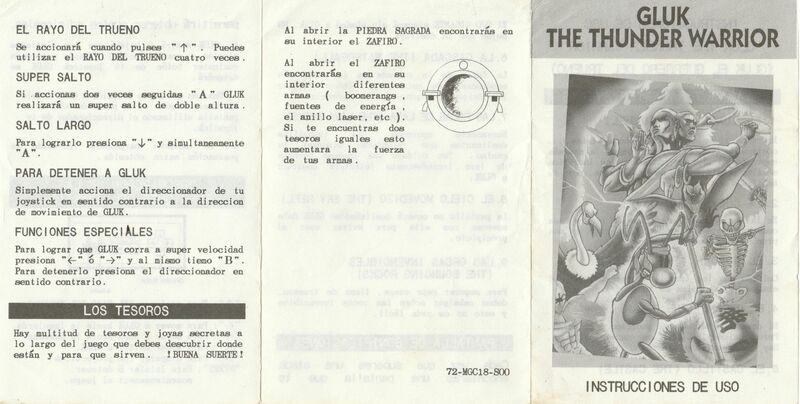 In the Discoplay catalog they costed 2.350 Ptas (14,12€) and included games from the 2nd and 3rd waves. It seems the prices started at about 2.700 Ptas (16,22 €) in the Micro Genius phase and 2.350 (14,12€) - 1.900 Ptas (11,4 €) on the NTDEC / Mega Soft / Caltron one. The games were also seen for rent. At least in Pryca in Christmas 1993 there were promotions of 3x2 in games. 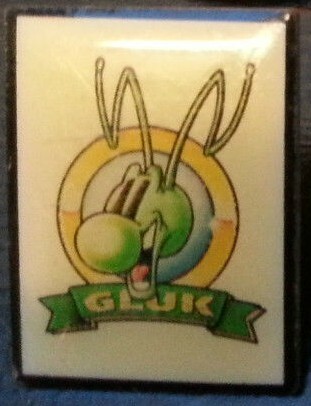 The first game to have a Gluk Video label. It was the first Micro Genius game but it uses the box design for the last of the titles. The title was not translated to Spanish. Included a badge with the logo of the brand. There is a version with instruction manual. 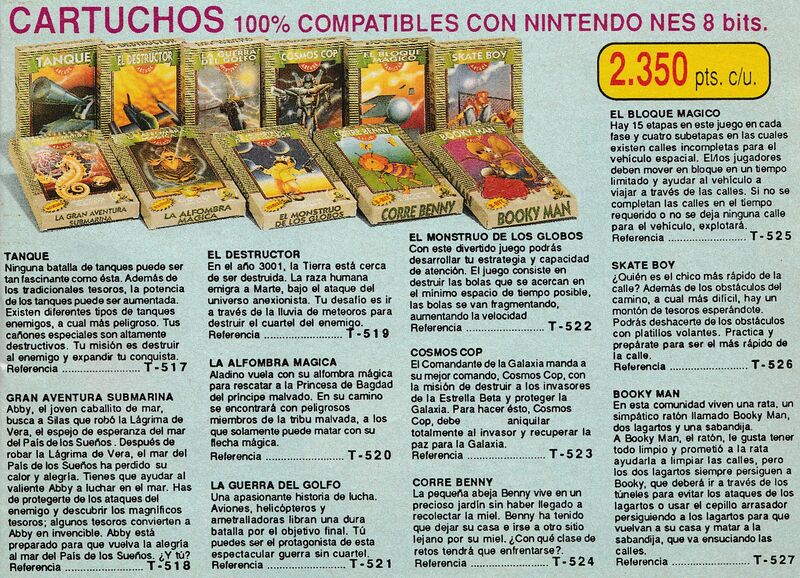 The titles of the games have not been translated (except "Comando de Lobos") and the box contains Spanish drawings, but not the label (except probably "Volley ball"), that preserves the original. 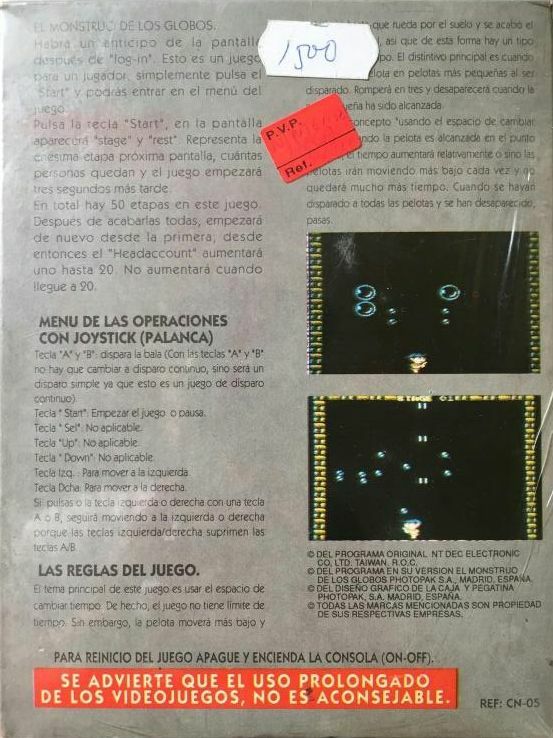 Model B Model B Model B Model B NOVEDAD ESTE VIDEOJUEGO ES COMPATIBLE CON LAS CONSOLAS NINTENDO NES, NASA, YESS, SILVER SHADOW, MICROGENIUS, CREATION, ETC. 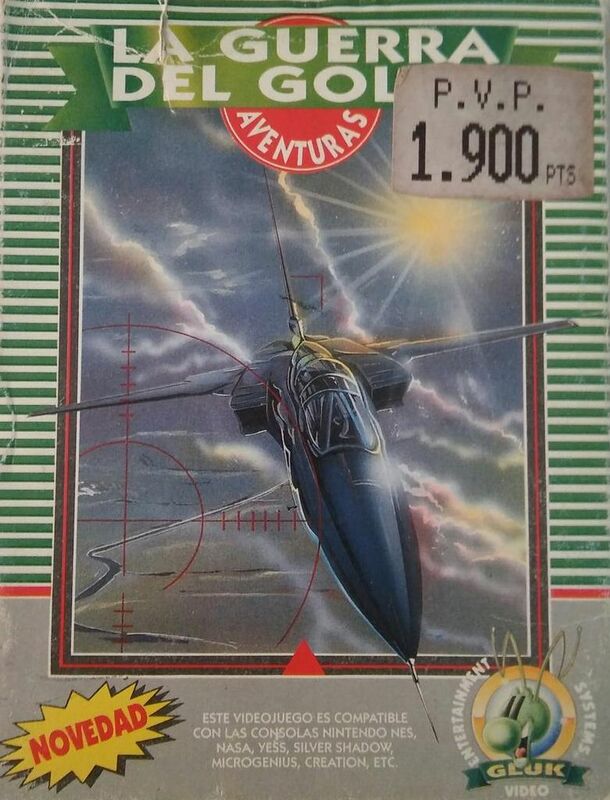 ESTE VIDEOJUEGO ES COMPATIBLE CON LAS CONSOLAS NINTENDO NES, NASA, YESS, SILVER SHADOW, MICRO GENIUS, CREATION, ETC. All the cartridges have the original label and the Gluk one sticked on top. The label of "El Monstruo de Los Globos" does not have the words "VIDEO ENTERTAINMENT SYSTEMS®" around the logo nor the phrase "PARA REINICIO DEL JUEGO APAGUE Y ENCIENDA LA CONSOLA (ON - OFF)", this was corrected in the label of the next version. All the titles have been translated except "Skate Boy" and "Cosmos Cop". Model B Model B Model B Model C NOVEDAD ESTE VIDEOJUEGO ES COMPATIBLE CON LAS CONSOLAS NINTENDO NES, NASA, YESS, SILVER SHADOW, MICROGENIUS, CREATION, ETC. A second wave of two of the previous models, "La Alfombra Magica" y "El Monstruo de Los Globos". "El Monstruo de Los Globos" has some variation. It's title screen music is different and has no ingame music. "La Alfombra Magica" has some variation. Some graphics change like the initial genie. The name "TXC" can be read on the back of the box although they have been developed by NTDEC / Mega Soft / Caltron. "Adan y Eva" contain pcbs of the Model B and the rest from the Model C (like "Booky Man"). The boxes were changed, these ones have better protection, like a coating of shiny plastic. All the titles have been translated except "Booky Man".